We are involved in the manufacturing of best quality Biology Lab Equipment for more than four decades. Our clientele for Biology Lab Equipment includes many well established science institutions, laboratories and industries. 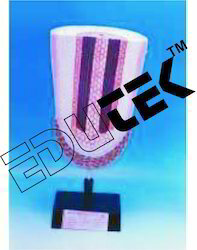 We are providing a complete spectrum of Biology Lab Equipment including Magnifier Glass, Dissecting Set, watch glass etc. We are an ideal Watch Glass Manufacturer. To make our products reach each corner of the world, we offer very low and attractive prices for them. 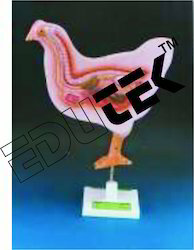 Natural size,domestic hen, the right side shows the feathers and the other side all the internal organs, on base with key card. Clearly showing the order and rate of formation of embryonic tissues and organs. It also brings out the close relations of the birds to the reptiles in mode of development and general construction. 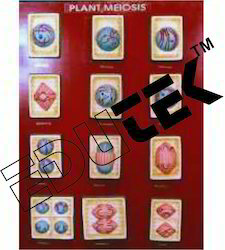 Complete development from egg to adult, set of 18, mounted on a large size board, with key card. A three dimensional model with one side dissected to show complete internal structures,mounted on base,with key card. A set of 10 models, showing resting cell, early prophase, prophase, late prophase, metaphase, late metaphase, anaphase, late anaphase, telophase and daughter cells, all mounted on board,with key card. A set of 12 models, showing detailed stages in meiotic cell division, realistically coloured to bring out the detailed structures as seen under a microscope. A very useful and instructive model, mounted on board, with key card. 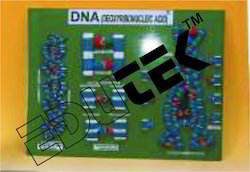 (Deoxyribonucleic acid) Model showing segment of D.N.A. molecule mechanism of replication, to show the double helix coiling and reforming, nucleiotides and the structural formula to show the molecular shapes and bonds and angles distorted. Complete model arranged on a board, fully labelled. 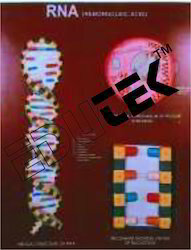 (Ribonucleic acid) Model showing R.N.A. molecule, D.N.A. Template molecule of chromosome, role of messenger and transfer R.N.A. colour key and structural formula. The complete model arranged on board, fully labelled. 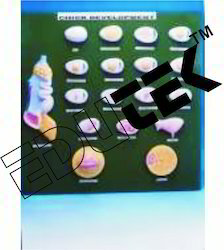 Large size model of a typical flower, all parts detachable, ovary with a single ovule inside, on base,with key card. A model showing the L.S. 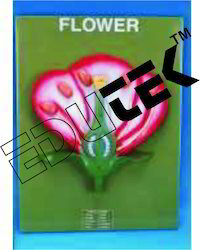 of a flower, mounted on board, with key card. 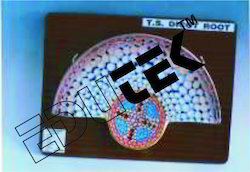 Enlarged many times, showing the microscopic structure, with key card. 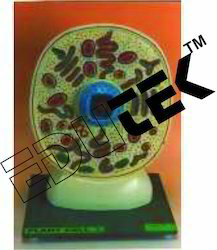 A highly enlarged model, as seen under electron microscope, a portion of wall is removed to show ectoplast, endoplast, tonoplast, vacuoles, nuclear structure, plastids, mitochondria etc., mounted on base, with key card. A detailed instructive model mounted on board, with key card. A set of 10 models showing all the stages of karyokinesis and cytokinesis from metabolic cell to the formation of two daughter nuclei. 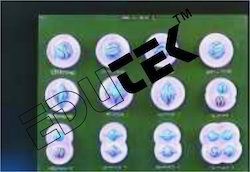 All stages are mounted on a board, with key card. A simplified and smaller set of 6 models. 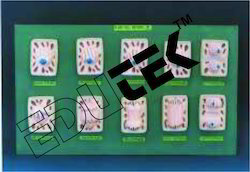 set of 15 newly designed models according to the recent concept of chromosome changes from the resting nucleus to the formation of 4 daughter cells,complete set mounted on board. A simpified and smaller set of 6 models. This model demonstrates the general arrangement of tissues. 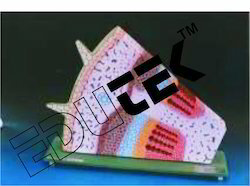 Stem is cut transversely, longitudinally, radially and tangentially at different planes to make the structural details very clear and the formation of various tissues easily understandable, mounted on stand, with key card. Showing complete internal details of the root of smilax, mounted on board,with key card. Showing complete internal anatomy of the young dicotyledonus root, mounted on board, with key card. The model shows the pointed growth resulting from an apical cell with the cells which branch out spirally from point of vegetation. Root shown in longitudnal and transverse sections, detachable, with crown of the root removable. This model exhibits the various tissues and the scattered, closed and collateral vascular bundles in transverse and longitudinal sections in maize. The large pitted vessels, spiral and annular vessels show the cell wall thickenings in L.S. Useful model for teaching anatomy of monocot stem. 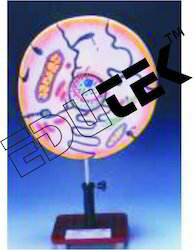 Mounted on base, with keycard. Dicot Stem Anatomy T. S. & L. S.
This model shows the transverse and longitudinal section of a dicotyledonous stem in which case the cambium ring has been formed but no secondary growth has yet taken place. Useful model for study of epidermis, lentice, cork layer, cork cambium, cortical parenchyme, starch sheath, medullary rays, phloem, sieve plate, sieve tube, phloem parenchyma and inter fasicular cambium. 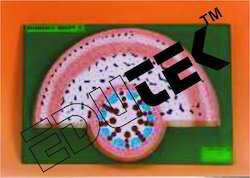 xylem, pitted vessels, bordered pitted vessels, annular vessels, spiral vessels, pith etc. Mounted on base, with key card. 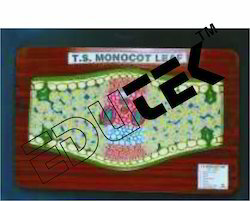 Showing details of internal structure of a typical monoco leaf, mounted on board, with key card. 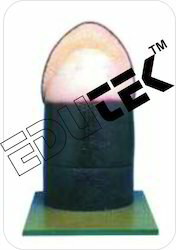 Vacuum formed on heavy duty plastic material to give a deep relief. Weatherproof & washable, capable of enduring years of rough classroom use. Realistically coloured, aesthetically pleasing and a great help to students to understand the subject. Useful for blind students as well. A 25 x 35 cm. sheets only in box. C 35 x 50 cm. sheets only in box. F 50 x70 cm. sheets only in box. G 50 x 70 cm. complete with hard backing,aluminium frame and hanging hooks.While size 25 x 35 cm is available in sets only, other sizes are available singly as well. E 35 x 50 cm complete with hard backing. aluminium angle frame & hanging hooksF 50 x70 cm. 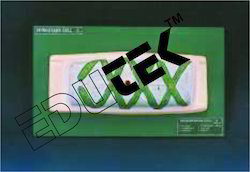 sheets only in box.G 50 x 70 cm. complete with hard backing, aluminium frame and hanging hooks.While size 25 x 35 cm is available in sets only, other sizes are available singly as well. 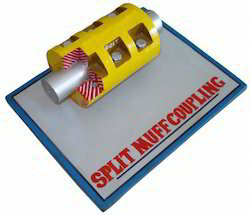 Edutek are leading manufacturer and exporter of Split Muff Coupling, Engineering Models and Mechanism Models For Educational and training. Properly Constructed Model. The two halves bolted together and one side is shown in section.